Authentic Original 5 Foot Micro-USB 3.0 Charging Data Cable for Samsung Galaxy S5 & Note 3 N9000. Compatible with all Micro USB 3.0 Devices. 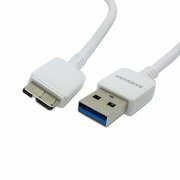 The cable is compatible with all devices with a Micro USB 3.0 connector, such as the Galaxy Note 3. USB 3.0 compatible for ultra fast data transfer. The cable has USB 3.0 for the fastest possible data transfer. USB 3.0 supports speeds of up to 4Gbit/s meaning you can transfer HD videos to your phone in seconds rather than minutes. Supports fast charging from laptops and desktops. USB 2.0 ports only support up to 500mAh which means charging will take 6 – 7 hours, this data cable from Samsung supports 800mAh over USB 3.0 nearly halving the charge time.